Hi readers! 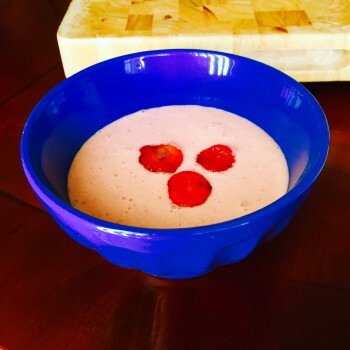 As promised, I have another strawberry themed recipe for you today that is inspired by a Carnival cruise I took late last year. For the formal dinner, I ordered the strawberry bisque and I fell in love right away. It was so cool and refreshing and it’s such a perfect recipe to make this summer, now that strawberries are in season. I looked up the recipe online and decided to recreate it with a few minor tweaks. Here’s my take. Blend strawberries and water in a blender. 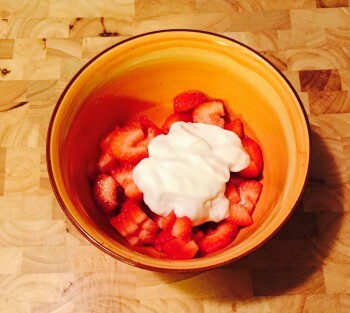 Stir in heavy cream, Greek yogurt and lemon juice. Chill for several hours before serving and top off with mint. *Side note: The original recipe calls for sour cream and you can add that or plain Greek yogurt. I decided to use honey flavored Greek yogurt in place of sugar but you can use 3/4 c sugar instead too. You can find the recipes I searched up here and here. 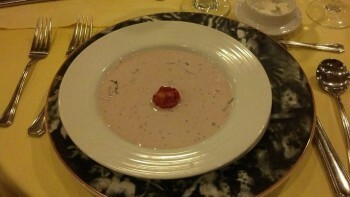 A picture of the strawberry bisque I had aboard the ship. And that’s it. An easy to make treat that you can enjoy with the family or share with others. Now I’d love to hear from you! Would you enjoy seeing more posts like these? Let me know in the comments.